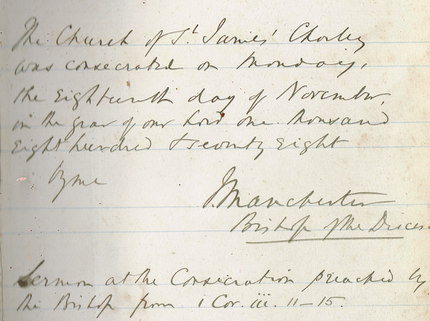 The Bishop of Manchester consecrated the Church on 18th November 1878. The cost of the building was £5,488 with the name, chancel, north and south transepts being built first. The foundation stone for the new church had been laid in 1877. The following Sunday Canon Master, Vicar of Chorley preached on “Holy Ground” in the morning and Revd. Stock, Vicar of St George’s Chorley preached on “A Spiritual Temple” in the evening. The following week, Advent Sunday, Rev Frederick Owens, who would become the first Vicar, read the Thirty Nine Articles of Religion in place of a sermon. Mr Owens had been Curate of St Laurence’s Chorley from 1869 to 1875 and then became Curate of St James in 1875 and Vicar in 1878. The Order in Council creating the new parish was issued in 1879. This also defined the parish boundary. The Church building has undergone many changes in the years since as each generation adapted to changing needs, perceptions and circumstances in seeking to make disciples for Christ and live as a Christian fellowship. The parish was formed from the parish of St. George’s Chorley and was not well received by the then Vicar of St. George’s, Rev John Stocks. The land for the Church was given by Robert Townley Parker of Cuerden Hall. The style of building was gothic revival. The church was enlarged in 1888 with north and south aisles, south porch and south choir transept being added. The east window was added in the same year. The south transept window was installed in 1908. In 1912 the original wooden bell tower was found to be unsafe and was replaced by a bell turret at the north west. Vestries were also added at the north east. A new organ was also installed in this year. The north transept window was added in 1928 whilst in the 1950s internal work was done to give the church a lighter feel. The reredos (carving behind the Lord’s Table) was added at this time and the old west entrance was also made redundant. The font was then moved from the back of the south aisle to the back of the main aisle and a new main door established. The west window and stained glass in the sanctuary side windows were added in 1977. Whilst in 1979 the organ was rebuilt. In the 1990s the choir stalls were removed and the chancel reordered including the addition of chairs, the building was redecorated and new lighting added. Later a sound system and desk, screens and projectors were added. The old south entrance was turned into a kitchen area to serve refreshments. In 2008 the heating system was replaced and as part of this the pews were removed and the whole of the church eventually carpeted. The old organ was taken out and the space used to create a room for children’s ministry. Further work is envisaged to improve the toilets, provide rooms for children’s groups, a brighter entrance, a kitchen equipped for making meals, much more storage space and ideally the ability to let out rooms for community use without the risk to security of equipment in the church worship area. The school as built in 1873 with a procession taking placeon Sunday 5th January. The school opened the following day with 86 children and Sarah Ann Meakin as headmistress. Due to increased numbers a new Infant School was built in 1894 with Miss Ada Bineham as headmistress. The school was on the ground floor with a Parochial Room on the upper floor and a large basement that was turned to various uses over the years. The infant school was found to be unsafe and was pulled down in 1964. A new infant block was built at that time and a hall later added in 1986. The foundation stone was laid on 13th August 1904. The Church institutes was opened in November 1905 by Lord and Lady Balcarres and was used for a variety of activities including bible study. The building was sold in the 1980s to become St. James’ Bowling Club. The money raised was used to build a parish room and kitchen/toilets on the school site. The parish room was sold in 2009 in order to pay for work on the Church. The bowling green opened 16th June 1906. The old Vicarage was at Eaves lane. It was certainly occupied by the Vicar in 1891 but was apparently purchased as a parsonage house in 1907. This was sold and a new vicarage built adjacent to the Church in the 1960s. The land on which the Vicarage is built was added to the Churchyard in February 1909. The Old Vicarage currently houses Meridian Funeral Homes.